Mere hours after Boss announced its new, compact RC-1 Loop Station, Electro-Harmonix has entered the fray with its own small-footprint looper pedal. "The NanoLooper 360 is a small, extremely easy to use, pedal looper with a total of 360 seconds of loop recording time which can be divided into 11 different loops for maximum flexibility and control. With uncompressed audio, 24-bit A/D/A and a44.1kHz sample rate, the 360 Looper delivers high quality sound and unlimited overdubbing with no degradation in fidelity. The user interface, featuring two knobs, three LEDs and a single footswitch, is intuitive and functions such as recording a loop, overdubbing, undo-redo and erasing a loop are quickly mastered. "The Level knob controls the output level of the loop. The dry signal remains at unity from input to output. The Loop knob is numbered and allows the user to select from 11 different loop locations. To record a loop, simply select an empty bank and press the footswitch once. The REC (recording) LED lights solid and recording starts immediately. When the footswitch is pressed again, the recording stops, and the loop will play indefinitely. Pressing the footswitch two times stops the playback. "Overdubbing is easy. When a loop is playing, pressing the footswitch once lets the user record on top of the original material and does not change its length. After finishing an overdub, the Undo-Redo function is enabled and allows the user to remove the last take. To undo an overdub during playback, simply press and hold the footswitch for one second. To redo the overdubduring playback, i.e. restore the last take, press and hold the footswitch for one second again. To erase a loop, playback must be stopped and the footswitch depressed for two seconds. All recorded audio is stored automatically to the NanoLooper 360's internal memory and all recorded loops remain in memory until they are erased. 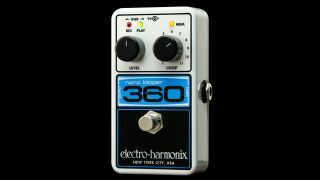 "With the NanoLooper 360, EHX's goal was to build an affordable looping pedal that would function as an easy to use, song creation and performance tool. The new NanoLooper 360 can use a 9 Volt alkaline battery, but comes standard with an EHX 9.6-Volt/DC200mA AC adapter. It carries a U.S. list price of $179.99."